Now you can wear leggings that show that you like tech stuff as the leggings have a circuit board on it. The circuit board is dark but the silver and yellow details make them really look amazing. And these geeky leggings look cool and are available in many women’s sizes ranging from size 0 going all the way to 16 and these leggings are made from 88% polyester and 12% spandex so that they feel great on your skin and have a nice stretch too. So now you can have some cool legwear that you won’t likely find in a store. 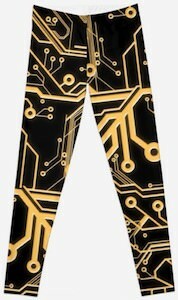 Come and have closer look at these Yellow Circuit Board Leggings. So you are the girl in need of some tech geek leggings, you are in luck as we found something nice for you. These women’s leggings show binary code and what is more tech the zero’s and one’s. As you can see on the picture the leggings show the code in different colors so that the legwear looks a bit more fun but there are just 0 and 1 characters on them. You can get these binary leggings in women’s sizes XSmall – XL (0 – 16) and they are made in Canada from 88% polyester and 12% spandex so that it get you a great feeling legging that has some stretch. Don’t wait just come and get your Binary Code Women’s Leggings. If you want a pair of tech leggings then these would be perfect. The black leggings have a system board printed on it and yes of course the design covers both front and back. When you wear these geeky leggings the world will know that you are in to tech and even on a component level. These women’s leggings are made from 82% polyester and 18% elastane to make them follow your bodies curves. You can get these mainboard leggings in sizes XXS – XL and they do have a tech waistband so that it just fits right. Come and take a closer look at these Tech Savvy Leggings. By now the world knows that girls like video games to and these leggings will make that clear just a little bit more. These women’s leggings show a graffiti style pattern with Super Mario on the top leading the whole graphics on these leggings. When you wear these leggings then you show of something you love and that means that the best way to wear them is just like that but they also look great with a skirt or shorts. And these Mario leggings are cheap to and even ship for free any where in the world. So get ready for you next game after you order these Nintendo Mario Graffiti Style Leggings. Are you the video game playing girl? If you are a true gamer then why not get some fun leggings that look like a game of Tetris. These black leggings have many Tetris game action happening and yes there are many colorful pieces on the leggings to. The Tetris leggings are made from a polyester / spandex blend witch makes them nice and stretchy. Lets get ready to play and start by wearing these Tetris Leggings. Are you that female gamer that likes the classics? If so then you are gone love these leggings. The leggings are black on the back and front but on the front there is more happening. You can find all the Ghosts from the Pac-Man video game and yes Pac-Man is there to catch the colorful dots. These Pac-Man leggings come in 3 sizes S, M and L and are made from a Dacron and Spandex blend that makes the soft and flexible to make them fit just right. 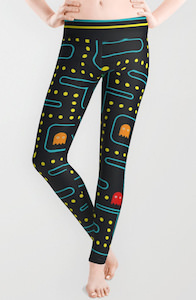 So if you want to show the world you love of video games then you have to get these Pac-Man Leggings.